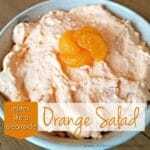 Tastes Like a Dreamsicle Orange Salad – bright orange flavor with a creamy, mousse-like texture. A sweet addition to any meal. Combine orange jell-o, vanilla pudding and hot water in a large saucepan. Continue boiling (and stirring) until mixture turns clear. Pour into a large bowl and chill overnight. Alternatively, chill until set (about 4 hours). Combine Cool Whip with jell-o/pudding mixture (a potato masher works well for this step). Add mandarin oranges and stir gently. Plan ahead - needs to chill. I am not a certified nutritionist or dietitian. All nutritional information is intended for informational purposes only and should be used only as a general guideline. This information is provided as a courtesy and there is no guarantee that the information will be completely accurate. The nutritional labels are calculated by an online calculator. Even though I do my best to provide accurate nutritional information, these figures should be considered estimates.